Firstly I just want to say a big thank you to everyone who have left me messages. It's always lovely to receive compliments on your work. 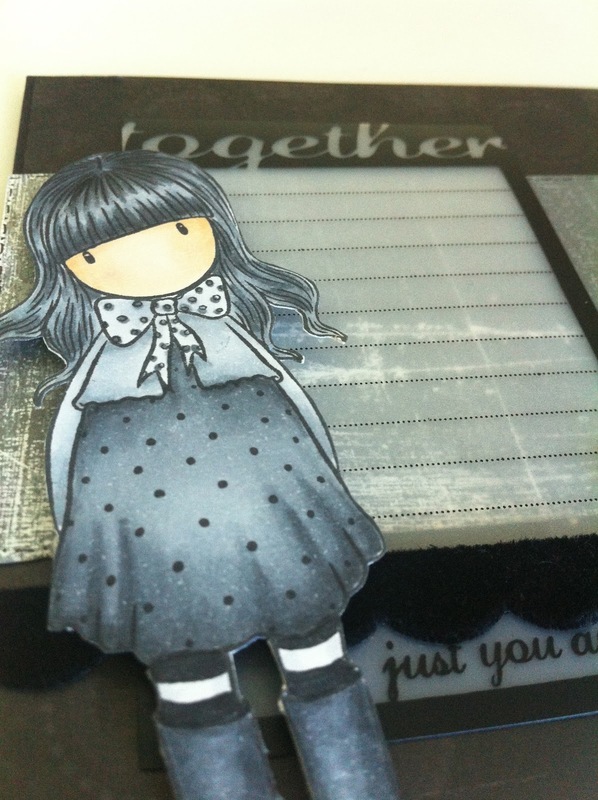 I didn't realise how many black/grey papers I had floating about in my stash! 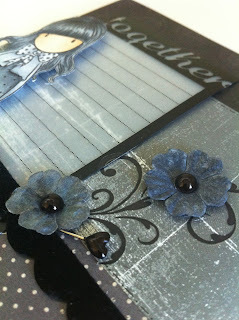 The papers I have used for this card are Scoops Black by Top Line Creations, All Fall by Nancie Rowe-Janitz for Fancy Pants Designs and AcidWashed Griffin by Basic Grey. I have also used a Maya Road Office Shear. I didn't have any black/grey flowers so I used my Copics to colour white flowers. I also used my Copics to colour the heart pin and pearls. The ribbon is from one of my local scrapping stores. I am almost out of this and can't remember which store I found it at! The rub on is from a $2 shop. My Simply Gorjuss stamp "Waiting" was coloured with Copics C1, C3, C5, C7 and C9. I used E50, E53 and R20 for her face. Hi Shell, such a pretty image and a wonderful card. Love the little flourishes behind the flowers and your layout it great.